Dr. Khoury has always recommended this program for patients to build strong muscles supporting the neck and back. 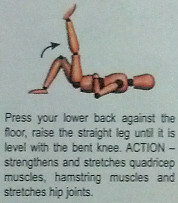 It's perfect for prehab or injury prevention, and a good way to ease yourself into activity after an injury. Do these exercises 3 times a week, 5 to 10 times each. If one of them causes you pain, then skip it -- and come let Dr. Khoury know so he can get you back in shape! 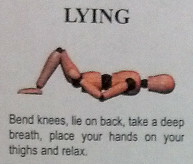 Lie on your back, bend your knees, and place your hands on your thighs. Take a deep breath and relax. 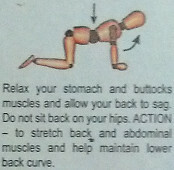 Tighten your abdomen and buttocks, and press your low back flat onto the floor. 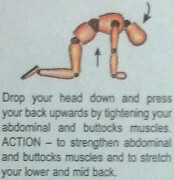 Turn both knees to one side, and turn your head to the opposite side. Pull both knees to your chest. 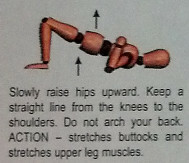 Slowly raise your hips upwards. Make a straight line from your knees thru your torso to your shoulders. Squeeze your glutes and do not arch your low back. Put your hands behind your neck, and tuck your chin into your neck. Tighten your abs and curl your upper body off the floor. Don't let your low back leave the floor! 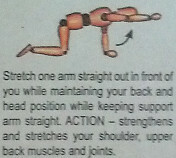 Lie on your back and bend one knee, placing that foot flat on the floor. Extend the opposite leg straight outwards. Take a deep breath and relax. Pull the bent knee towards your chest, keeping the opposite leg straight and touching the floor. Press your low back into the floor. Raise your straight leg into the air, keeping the knee straight, until both thighs are in line. Repeat the last three steps with the other leg. On your stomach, raise one leg straight off the floor, keeping the knee straight. 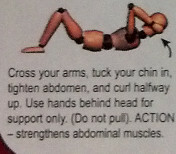 Push your upper body into the air, with your forearms flat on the floor. Tuck your chin down into your neck, and keep your hips and abs flat against the floor. Get your knees directly under your hips, and your hands directly under your shoulders. 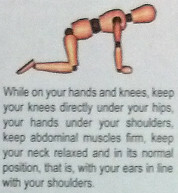 Keep your abdominal muscles firm, and keep your neck in a relaxed position with your ears in line with your shoulders. Tuck your chin and drop your head down. Press your back upwards by tightening your abs and glutes. With your abs and low back neutral, stretch one arm out straight in front of you. Extend one leg straight behind you, parallel with the floor. Repeat this step and the last one with the other arm and leg. Slowly tilt your head from one side to the other, looking forwards. Place your palms on your forehead. Press your head forwards, resisting the motion with your hands to build strength. Clasp your hands behind your head, and press your head backwards against them. Turn your head from side to side, resisting the motion with a hand placed on the side of your head. Tilt your head sideways, resisting the motion with your hand.